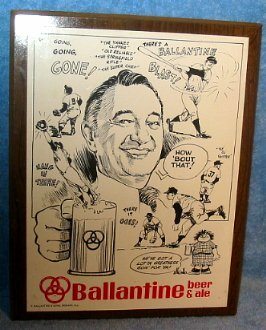 Ballantine Beer & Ale baseball theme sign; 10 1/2 x 13 1/2 inch, Decal on pressed board sign featuring Mel Allen, the voice of the New York Yankees. Probably 50’s vintage. Great cross-collectible in very nice shape. The only issue is that the easel stand is missing from the back of the sign. It is about 1/4 inch thick pressed board, so a hanger can easily be added.